On Thursday April 13, I attended an interesting talk by Doug Chiang, academy award winning artist and production designer, on the production design of Rogue One at Star Wars Celebration Orlando. Throughout the hour he went into detail about the process behind creating certain shots, environments, and characters and vehicles for the movie. 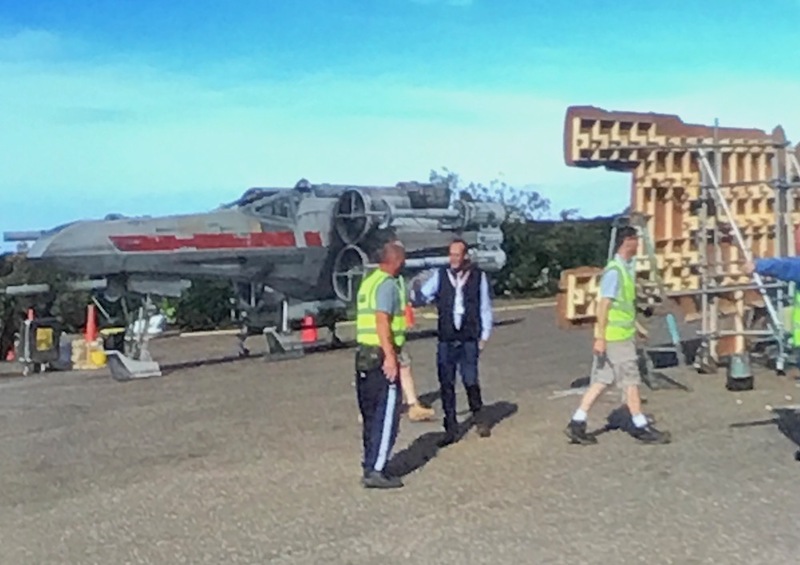 This article will cover some topics discussed and give readers a behind the scenes look at the production design of Rogue One: A Star Wars Story. At the beginning of the talk Chiang went into some background of how he got started with art and Star Wars. It began with the work of Ralph McQuarrie. McQuarrie used a contrast between low and high detail to get that iconic Star Wars style. Not only has McQuarrie’s designs influenced the Star Wars movies, including Rogue One, they also influenced Chiang’s work and career. One of the things we learned was that Star Wars has an established look and the design is an art form. When designing any set or piece for Star Wars artists need to make sure it looks like Star Wars. What does this mean? 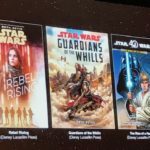 According to Chiang Star Wars is “heavily rooted in reality.” We can see design elements that are taken from real world timelines and sources. For instance in the prequels we see elements that look handcrafted with the elegance of the 1920s and 1930s. During the original trilogy the movies took on the manufactured look of the 1970s and 1980s, while the new trilogy has a more modern feel with contemporary technology. 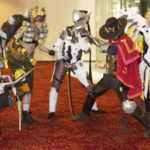 However, the artists also had to bridge timelines and combine the different looks. For Rogue One it was transitioning from Episode III with the early 20th century style to Episode IV. In The Force Awakens we still have some of the old elements from Episodes IV – VI with the Resistance ships and of course the Millennium Falcon but the First Order and New Republic had newer designs for that time period. 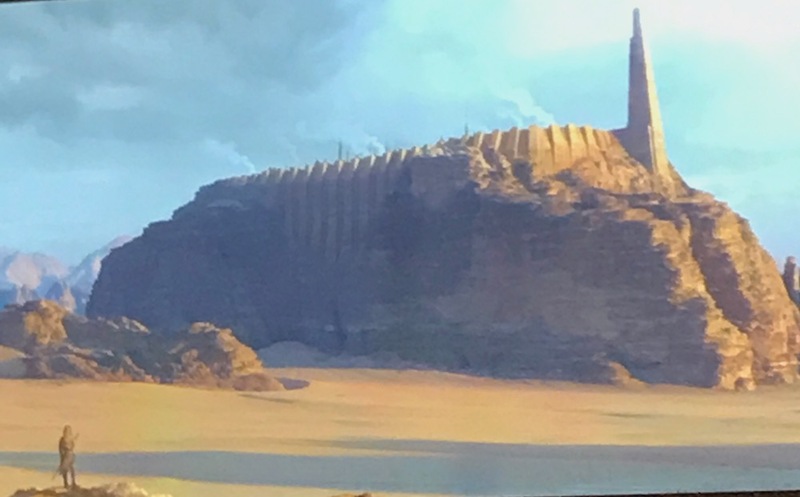 When it came to Rogue One Doug Chiang said that the design was intended to transition to Episode IV by giving the beginning some look from the prequels but keep a larger portion with Episode IV aesthetics. 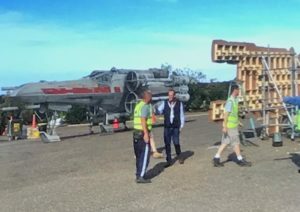 We saw in the movie use of sets used in the original movies including Yavin IV, which was close to A New Hope as possible and the battle of Scarif including ships and elements seen in the original trilogy. 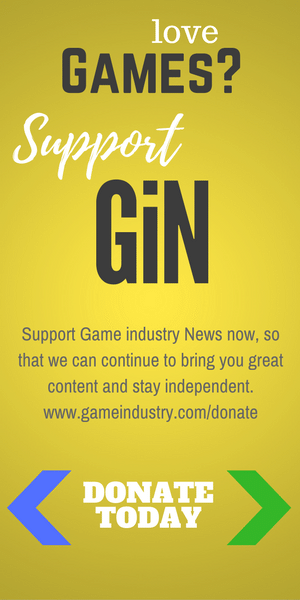 There were also new characters and ships that had to be created. 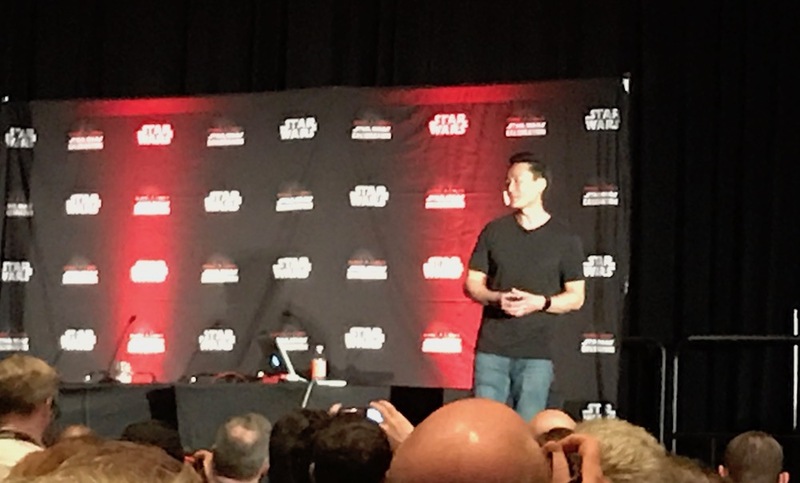 This is where the rest of the talk was focused on, the design and creation of the characters, sets, and ships of Rogue One. Along the way we also learned more about the making of the original trilogy and George Lucas’s vision. Another thing that was learned was the amount of time it took to create the designs. From concept to post-production took about 4-6 months and some of that was refining designs to give each character and set the Star Wars look and to fit within the movie. 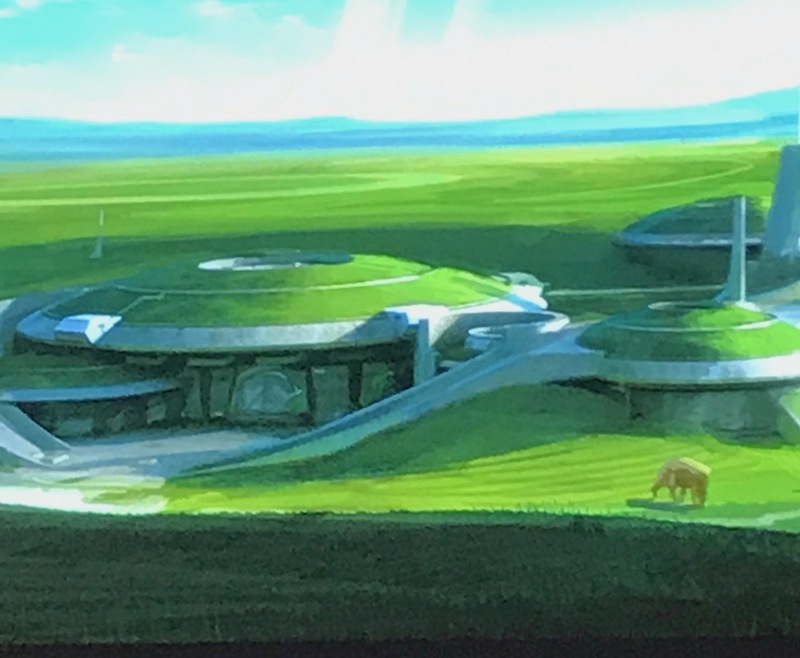 Early concept of Jyn’s homestead. The story of Jyn Erso was reflected in the way the design team created the sets and environments. Jyn Erso, the hero of the story, was the opposite of Luke Skywalker. Luke wanted to leave his simple farming life behind for adventure, Jyn on the other hand began her story as a warrior but wished to live her simpler life on Lah’mu. In the beginning her family was hiding out on Lah’mu until Director Orsen Krennic and his Death Troopers found them. This started her new life and path leading to Scarif. A way to show Jyn’s story progression was to use light. We have her starting out on a cloudy rainy world and each moment of uncertainty to hope was marked by the environmental light. At the end on Scarif she knows her mission and her place in the galaxy, therefore Scarif is seen as a bright world. 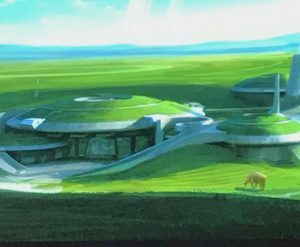 The homestead originally was based off of Ralph McQuarrie paintings and had rolling green grass and a hidden rock form as the house. This was similar in design to Luke’s igloo home on Tatooine. Because they were hiding the rock structure was under a grassy hill with a moisture vaporator in the background. The design team went to locate a place in England where they could add a matte painting and add in the other homestead elements. Because of filming constraints the Homestead ended up being filmed at a rainy and rocky location in Iceland. Filming constraints may affect locations but character creation has more freedom. 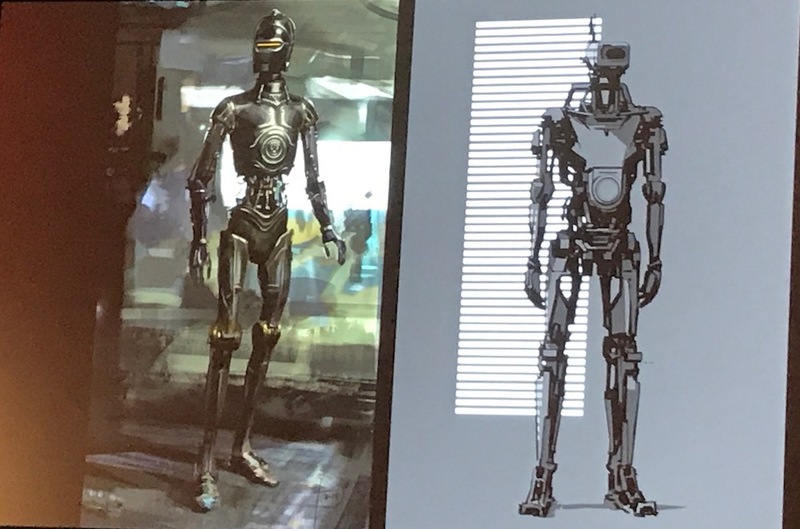 However, the design process is still long as we saw in the creation of K-2SO, the Rebellion’s converted Imperial security droid. The Rogue One design team was looking at making K-2SO as the anti C3-PO and made the original design as a C3-PO painted black. Where C3-PO was a droid that was helpful and non-violent K-2 was a former Imperial droid that was more powerful and menacing. 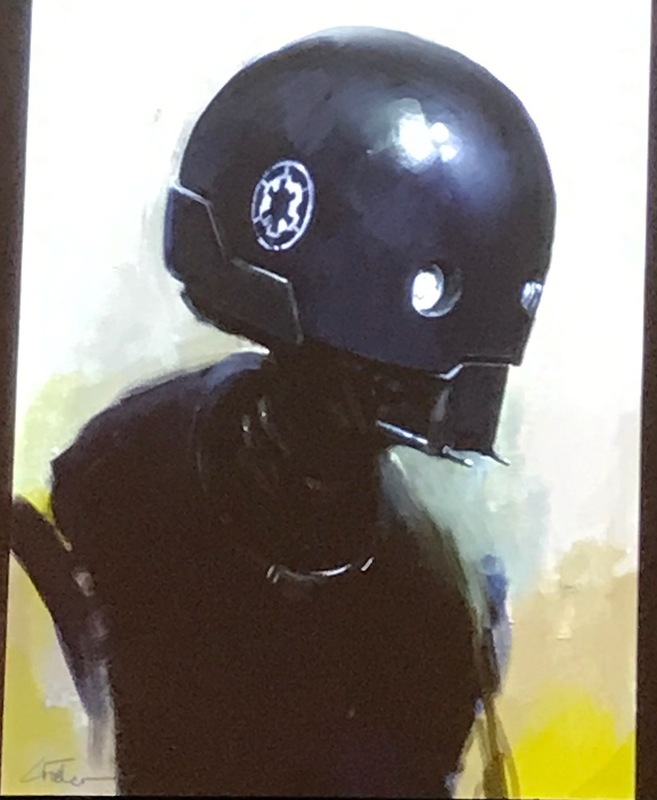 Doug Chiang said that they went from what would have been an Imperial protocol droid to the design of an Imperial security droid. Getting the right look required lots of tweaking of designs and the artists had to push concepts as far as the Star Wars design would allow. Some designs had him with a transparent head to something that looked more like the drones from Iron Man 2 or the robots from Infinite Warfare, not Star Wars. To fix the design problem the production team went back to the elegance of the protocol droid paintings of Ralph McQuarrie and made rougher versions. 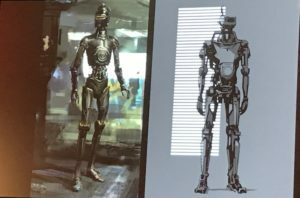 They took that basic design and elongated the legs and arms, combining different droid elements, beefing up the body, playing with a head until the design that we saw in the film was agreed on. It was also a design that combined the old and new styles seen in the movie. Being a new planet in the Star Wars universe Jedha had more than just a design element it also had to have a story. For instance, how did the Kyber crystals form? This was explained by the location of the temple. The concept of the city had ancient biblical overtones according to Chiang and it was a photo of Jerusalem in the snow that lead to the concept of Jedha as a cold dessert with temple complex. It was the temple that was the main focus of the design but also the Empire’s interest in the location. With the Empire needing large Kyber crystals to power the Death Star they included that in the backdrop with the Star Destroyer overhead. Why a plateau? The team wanted to have a city at the edge of a cliff but also they looked at real life meteor craters. In the center of a crater is an area of uplift and that could also be how the crystals formed. Using those real world concepts they created a Temple city on the plateau created by a meteor or asteroid. They also took the design from cities in Israel and Jordon to create matte paintings along with Morocco to get street level designs. From these concepts the buildings for the city were created at Pinewood Studios in England with the areas not built extended digitally. Another added element was the overcast skies at Pinewood used as the shadow of the Star Destroyer. Because of the overcast skies sunlight was added digitally. As for the temple, the design not only created this twin tower silhouette but also was a functioning design to channel lightside force energies. The same design was used for Vader’s temple with his channeling and attuned to the darkside of the force. When watching the Yavin IV scenes they look like the scenes from Episode IV and for reasons Doug Chiang explained to us. 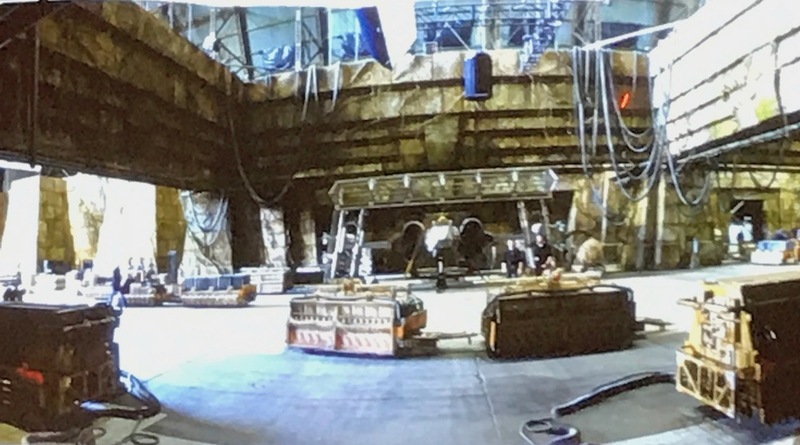 First the base is still a hanger under a pyramid, but not the same one seen in Episode IV. This one is looking from a different location then the original and was closer to the entrance that what George Lucas created. During the filming of Episode IV the exterior shots for the Yavin temple were taken from Guatemala. For the Rogue One scenes they couldn’t shoot in Guatemala so the next best place was Palenque in Mexico. Getting the actual rocky hanger entrance lead the team to England. These locations helped create the layout and look of the Yavin base but the real set was actually built at the same location George Lucas used at a Royal Air Force base in Bedfordshire, England. It was used mainly for logistic reasons because it was bigger than a set at Pinewood but also when the hanger doors opened natural light came in. Actually, even though the X-wings are large, 41 feet in length, and the base extended from the original, only half of the hanger was used. To give added detail X-wings were placed on the outside of the set. However, these weren’t actual props but matte paintings on plywood. In post-production the base was enhanced digitally to combine all elements, both the interior and exterior. Lastly we move to the new vehicle, the U-wing. Originally designed to be a Huey helicopter version of a Star Wars vehicle the U-wing was used as a troop carrier and attack fighter. This design was also influenced by hydroplane boats, again adding the real world look. That twin pontoon look was also seen in the Bespin cloud cars and Coruscant speeders. For the U-wing the pontoons became wings that opened up and the helicopter engines were set high with the body underneath. The belly caused problems with the original designs. 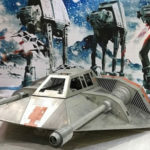 It looked heavy but the issues were solved by making the underbelly detachable and made a troop carrier into a fighter. Infusing the design with elements from the A-wing and Y-wing gave it more of a original trilogy look. 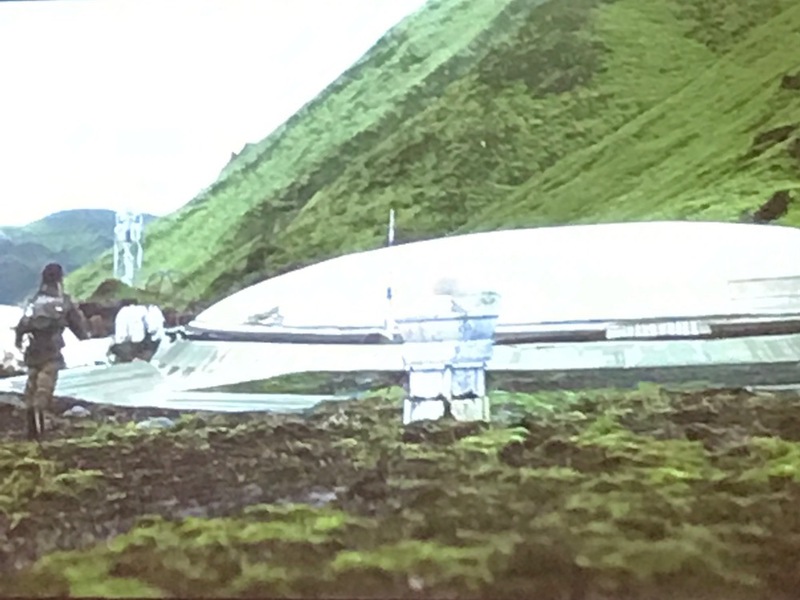 According to Doug Chiang it took a lot of refining to get the model right including bigger engines and a more aggressive feel. Eventually the model we see in the movie worked. Another issue was creating the exterior and interior for filming. Using an actual helicopter was not possible due to FAA regulations so a shipping container was used. For filming the inside of the U-wing a full interior was constructed with a partial exterior for close shots. With a shipping container they could then suspend it for height shots and place the set on a motion base for moving shots in front of a screen. With U-wing the talk was concluded with just some added video of how the designs came together. What I learned from this was the work put into designing Rogue One was extensive and in the end worked to bridge two time periods and tell a story set in the Star Wars galaxy.